LOCATION: The Carter-David Cemetery is located in the SW/4 of the NE/4 of Section 14, T4S-R8W. It is approximately 20 miles north-northeast of Ocean Springs, Mississippi. DIRECTIONS: From the intersection of US 90 and Mississippi Highway 57 east of Ocean Springs, go north on Highway 57 20.4 miles to School House Road. Turn left (west) on School House Road and go 1.2 miles to the cemetery. The Carter-David Cemetery is on the east side of the road about 1000 feet southeast of the Upton David home which is built over 180 feet above sea level on the highest elevation in Jackson County. HISTORY: The land where the Carter-David Cemetery is located was patented to Seaborn H. Bilbo in 1883 (Jackson County Deed Book 17, p. 48). Bilbo and wife, Louise, sold the E/2 of the NW/4 and the W/2 of the NE/4 of Section 14, T4S-R8W to Sarah Ann Davis Carter (1850-1923) in August 1895 (Jackson County Deed Book 17, p. 47). She was the wife of William M. Carter (1821-1895), a farmer. Carter completed a two story, nine-room house on the 160-acre farm in 1878. The Carters reared a large family of at least seven children on their 160-acre estate. Son, Prentice B. Carter (1868), ran a general store and his wife, Eliza (1867) was postmaster in 1910. In February 1902, seven years after the death of William Carter, Sarah Ann Carter sold the W/2 of the NE/2 and the E/2 of the NW/4 of Section 14, T4S-R8W to Abizer Havens excepting 16 acres in the S/2 of the SW/4 of the NE/4, and a 30-foot square around the grave yard. In August 1904, Havens conveyed the same property, which included the Carter Family home to William Ross David (1869-1919) also excepting the cemetery (Jackson County Deed Book 29, p. 13). David was born at Dead Lake in Jackson County on November 17, 1870. He had married Mary Carter (1873-1942), a daughter of William and Sarah Ann Carter, in 1897. The David’s had homesteaded a few miles from the old Carter home, and Mary Carter Davis was delighted to return to her childhood residence. The Davids had five children: Elmon (1898-1918), Edwina Haus (1902), Estelle (1907), Upton (1908-1993), and Lydean (1909). Commencing at the Southeast corner of the Southwest quarter of the Northeast Quarter of Section 14, Township 4 South, Range 8 West, Jackson County, Mississippi thence running west 597 feet; thence running North 1012 feet to the Point of Beginning. From said Point of Beginning run thence East 35 feet; thence run North 60 feet; thence run West 35 feet; thence run South 60 feet back to the point of Beginning. Prisilla Ellen O'Reilly was appointed as Trustee to administer the cemetery thus established. (Jackson County Deed Book 867, p. 133, August 14, 1986). The History of Jackson County, Mississippi, "The David's Old Farmhouse", (Jackson County Genealogical Society: Pascagoula-1989), p. 72-73. 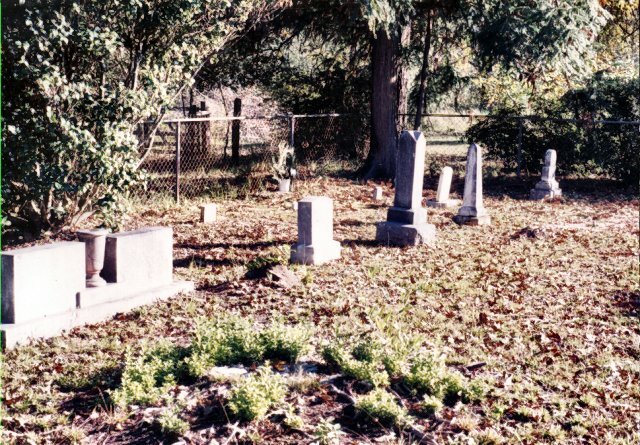 Requiem (Volume III), "Old Carter-David Cemetery", (Jackson County Genealogical Society: Pascagoula-1972), p. 77. The Daily Herald, June 10, 1919, p. 4. The Sun Herald, "Upton S. David", September 3, 1993, p. A-2.